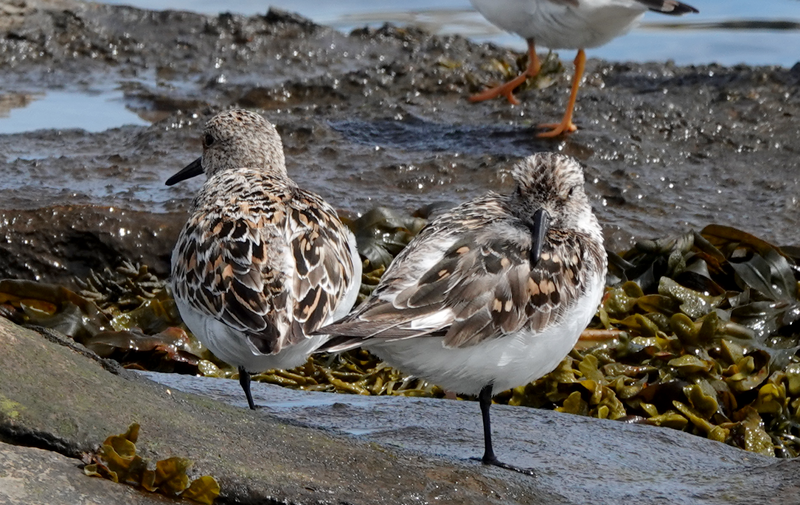 This was my second trip to Northumberland this year, after a mid summer trip for the breeding birds on Inner Farne. 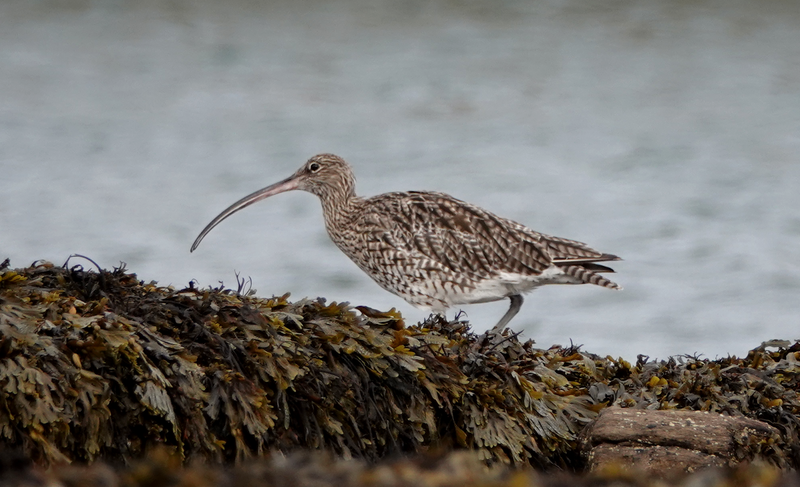 With a fair wind I hoped for some migrants and explore the area around Seahouses where I stay. 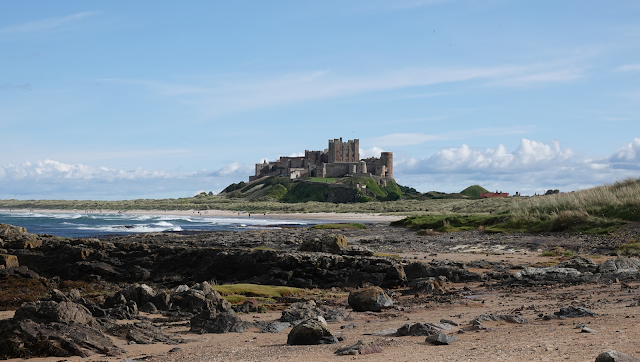 After my train journey to Berwick was delayed by 40 minutes, I missed the connecting bus to Bamburgh, meaning I had to get a taxi, which wasn't an arm and a leg exactly, but money that could have been spent better elsewhere. Regrettably, this experience is all to common on our broken rail service, and a 23 minute delay was blamed on a vehicle colliding with a level crossing near Stevenage. Why we were getting progressively late as we headed north went without explanation. 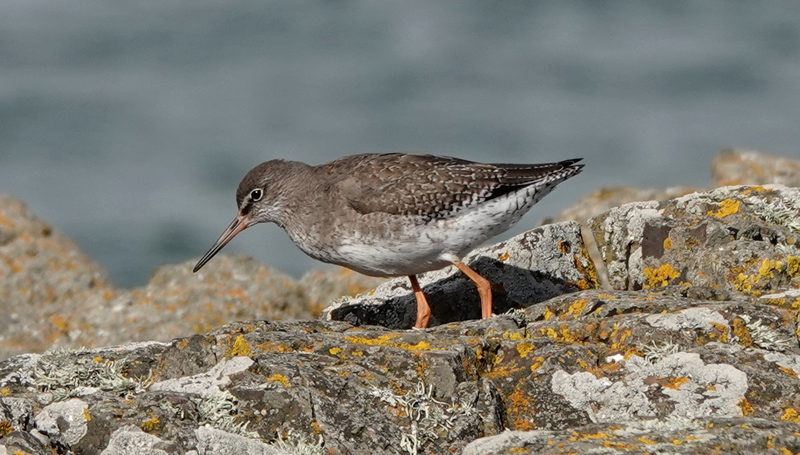 Being dropped off near the castle, I headed for Stag Rocks, where I figured the first Purple Sandpipers might be gathering. However there was nought but Turnstones and the odd Common Redshank. Off shore Sandwich Terns and Gannets were dive bombing the waves. A storm building off shore looked menacing and fearing a deluge I sheltered in the lee of the lighthouse wall. 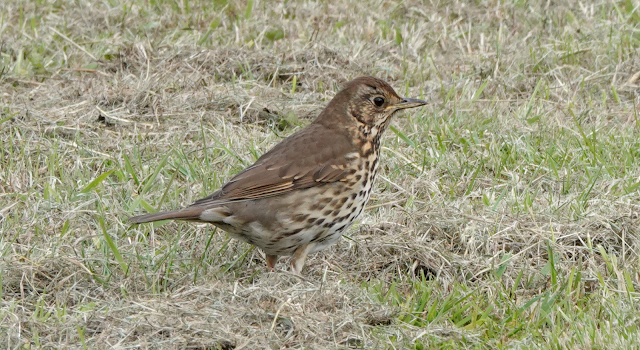 Fortunately the ensuing downpour wasn't as cataclysmic as I had feared, but put paid to any birding for half an hour. 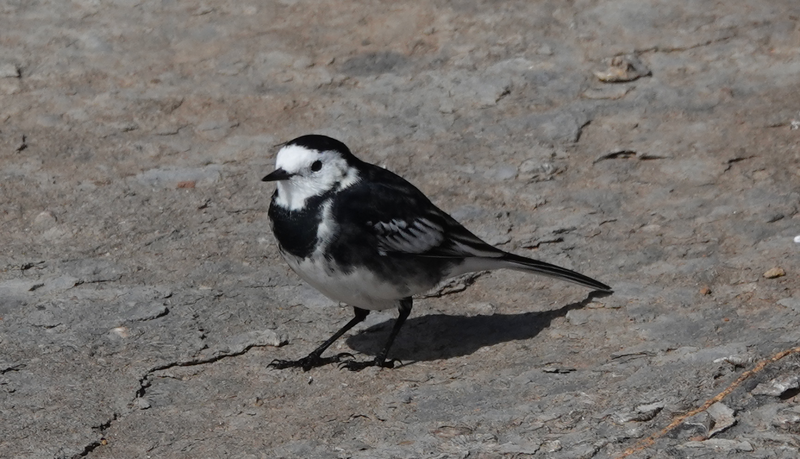 There seemed nothing in the way of migration and House Martins were still tending their nests when I returned to Bamburgh, where I got a bus to Seahouses. The castle is surely one of the most aresting in the country, dominating the coast in its grandeur. 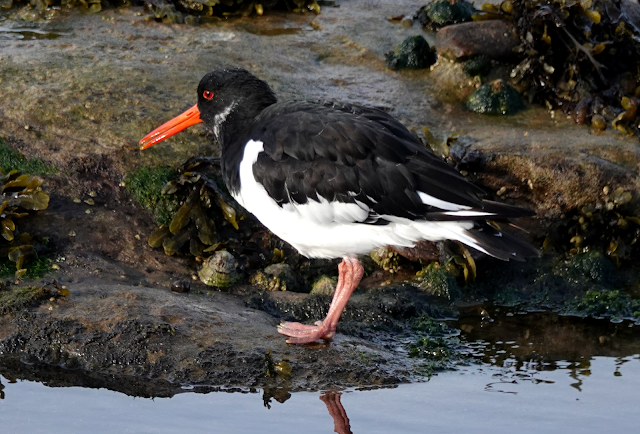 Checking out the harbour area at Seahouses, Oystercatchers, Turnstone and Common Redshank were the stock species and several Great Black-backed Gulls were loafing around the harbour walls. Feeling decidedly peckish after my long day, I decided to grab some dinner before dropping off my gear at my digs. 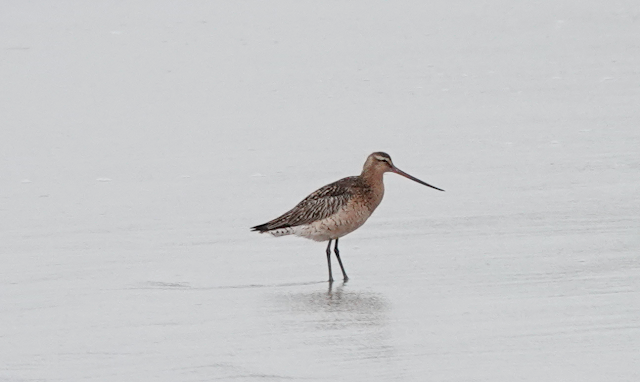 Exploring the beach and rocks at Annstead, I saw a handful of common waders, including a Bar-tailed Godwit. 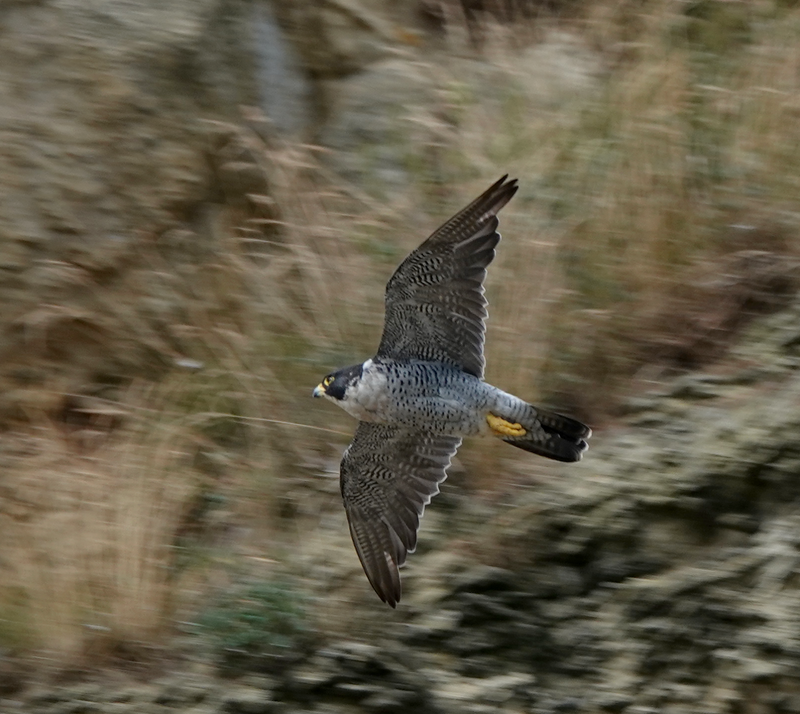 The bird was rather nervous but flew close enough by for a passable record shot. The following morning was dry with high cloud, producing a rather milky sunshine. 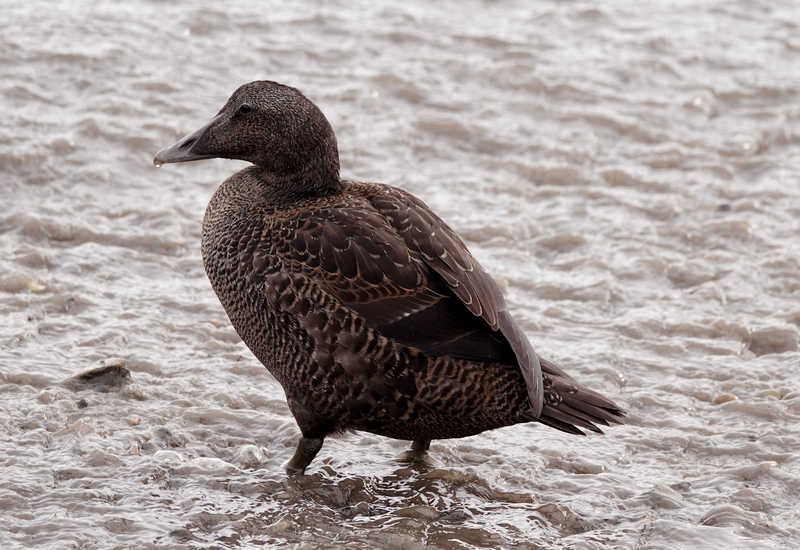 I checked out Seahouses harbour where there were the usual smattering of waders including several Curlew and some ridiculously approachable Eider. 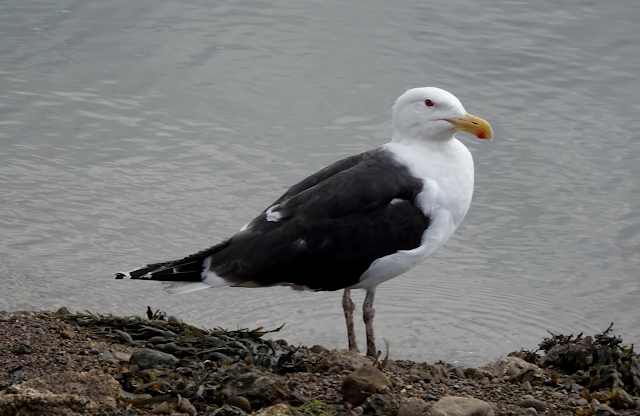 I'm told these bird have taken a liking to fish and chips, at the expense of thin egg shells. I don't suppose this tameness will result in the same public anxiety that has been associated with Herring Gulls. As the clouds thinned out, I headed north along the Bamburgh road for about a mile until I reached the roadside pool at Monk's House. Here there were several Grey Herons, Shoveler, Eursian Teal and three Black-tailed Godwits. 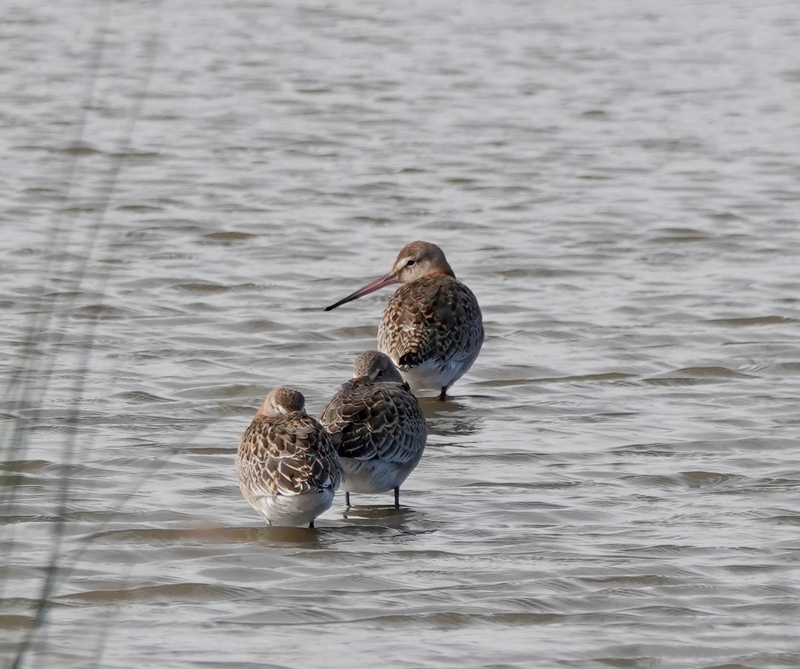 One bird was feeding, but the other two remained resolutely asleep for the 30 minutes I was there. Since first light Small skeins of Pink-footed Geese had been moving south east and were the only sign of migration. 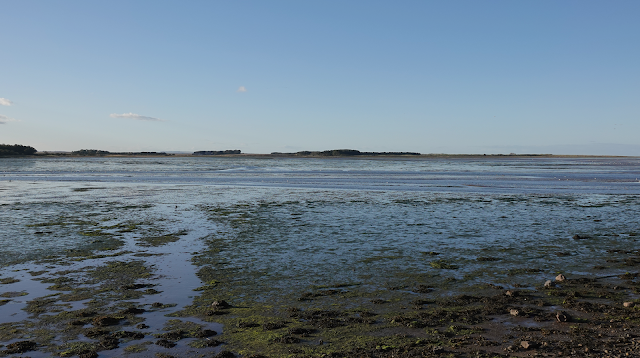 Walking back to Seahouses, the tide was coming in, meaning that waders were coming a bit closer, if one could deploy the right field craft. 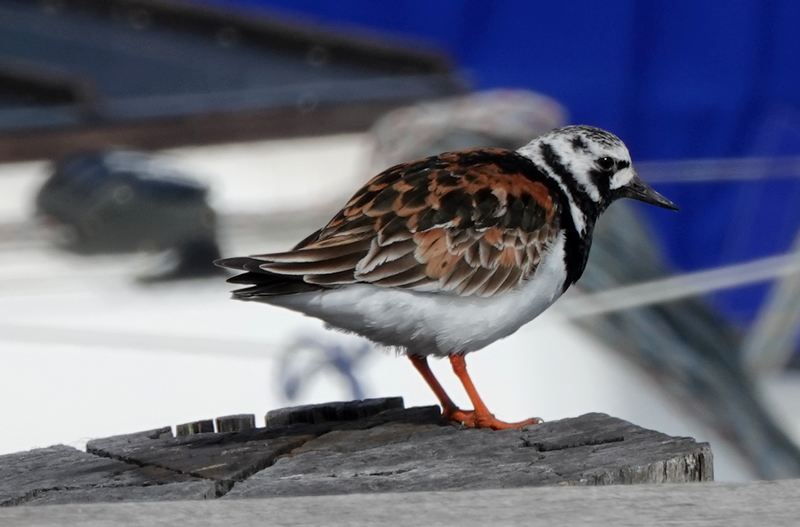 Finding a boat moored where the water was lapping around the keel, I managed to position myself such that birds approached close enough for me to get some decent shots, including a nice juvenile Ringed Plover. After a light lunch I headed south, picking my way through Annstead Dunes, in the hope of kicking up a migrant. 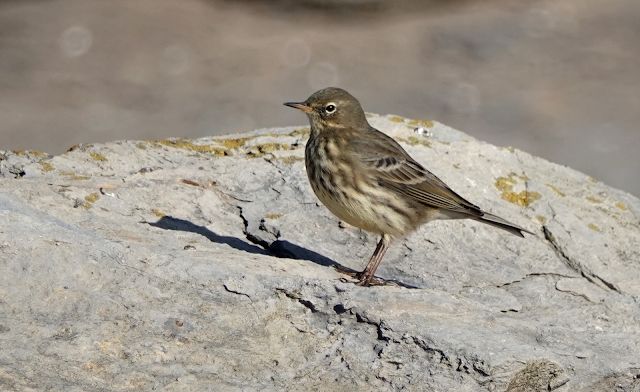 However, the persistent westerly winds meant there wasn't even a sniff of migration. Not a single crest, Chiffchaff or anything. 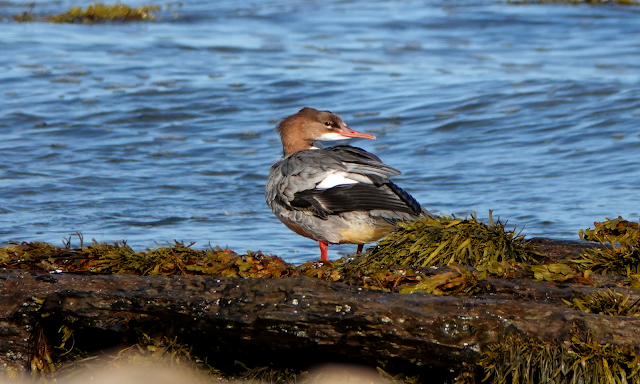 Continuing on to Beadnell, I saw a female Goosander loafing on the rocks. Finding a bench from where to watch the coast and high tide roost, I was joined by local birder Lucy McGregor. She suggested we go and check out Budle Bay. Accepting the lift, we drove north and parked up in the layby that overlooks the bay. 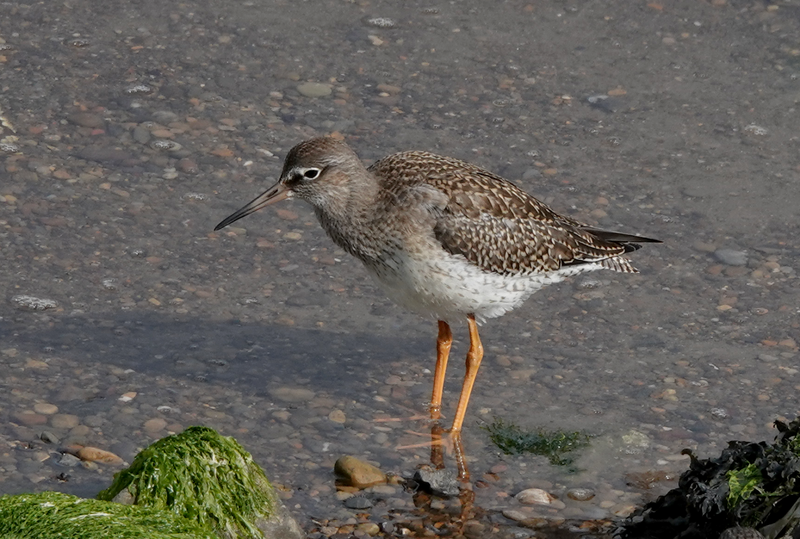 There were stacks of commoner waders, along with good numbers of Shoveler, Eurasian Wigeon and a few hundred Pink-footed Geese on the far shoreline. On the way back, we checked out Stag rocks, but no Purple Sandpipers were showing. 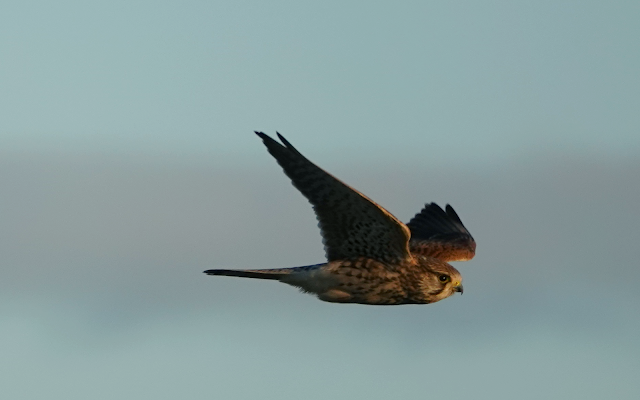 At the nearby golf course, with the light fading we checked a large flocked of Linnets, and a hopeful Kestrel, which showed beautifully, lit by the setting sun. The following morning began with unbroken sunshine and a walk around Lowgos Bay provided some excellent photographic opportunities, including a lovely Rock Pipit. 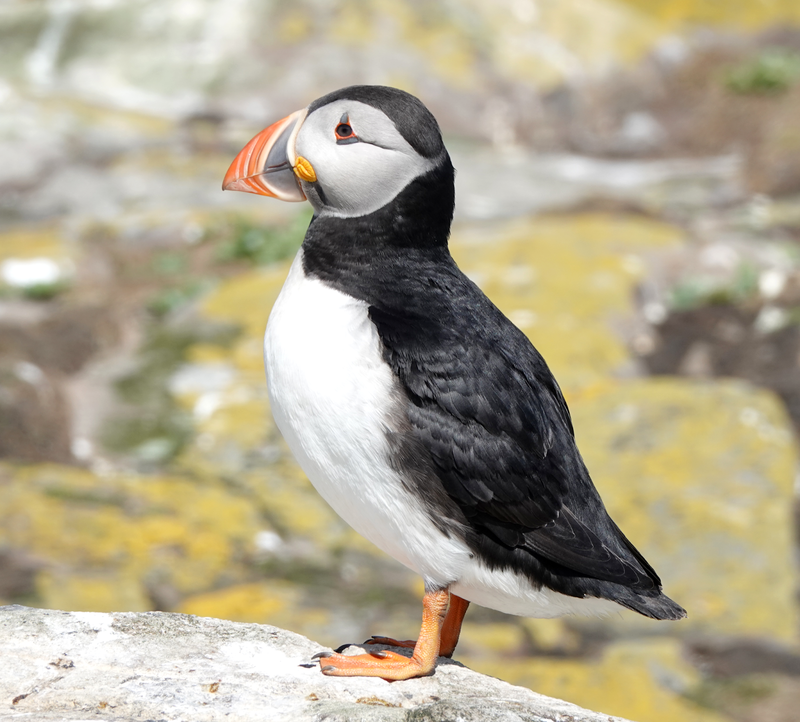 In the absence of any migrants, I opted to embark on one of the 90 minute cruises that go around all the Farne islands. Birdlife was in short supply and I even failed to capture a Gannet, struggling to track the birds on the bumpy sea. 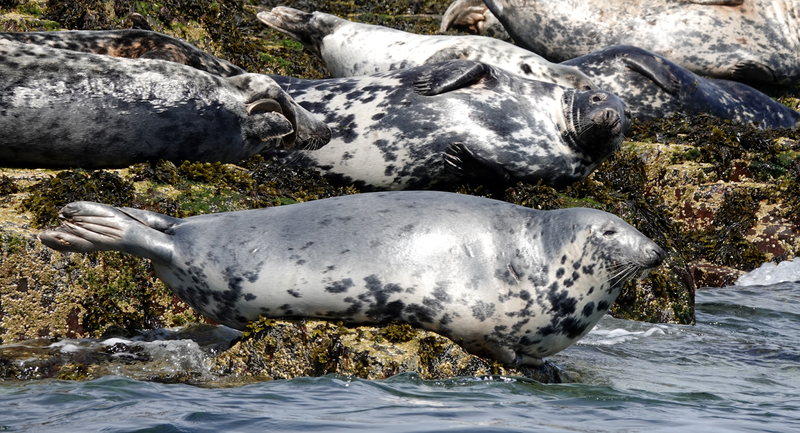 However, the Atlantic Grey Seals were performing on the rocks near Staple Island. It's great to see these mammals up close. On arriving back at Seahouses, Common Starlings were gathering on the harbour wall, and the adults looked amazing in the sunshine. 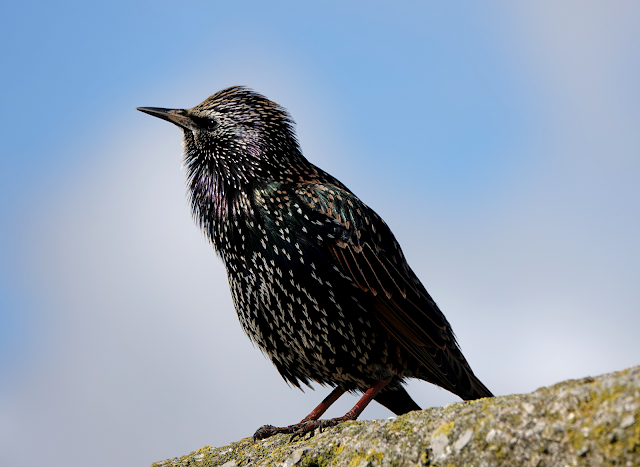 These are such splendid birds with their plumage and iridescence. I had just enough time to grab my bags from the digs and catch the bus back to Berwick and my train home. I was on the Yorkshire coast for my now regular late summer sojourn in the seaside town of Scarborough. This serves as a nice base for my mother while I go birding. 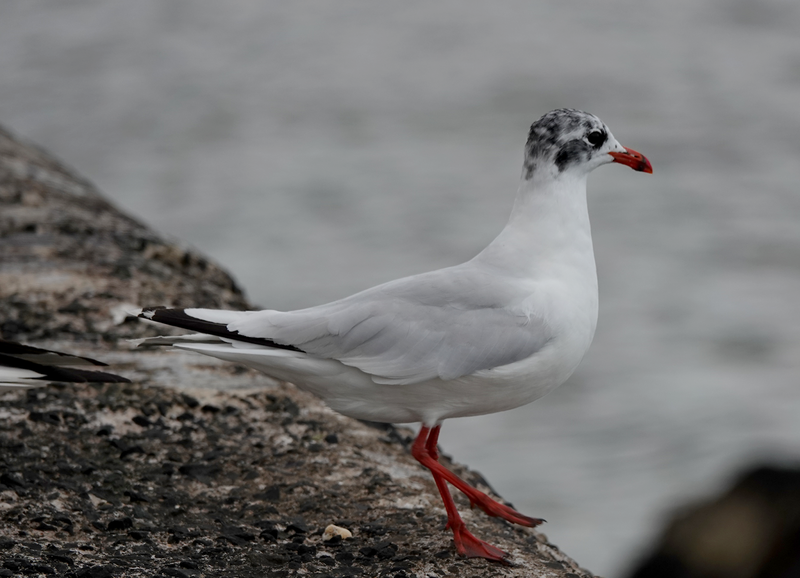 I made two visits to the bay at the south end of the town, where Mediterranean Gulls can be lured with bread or in my case a fruit scone. 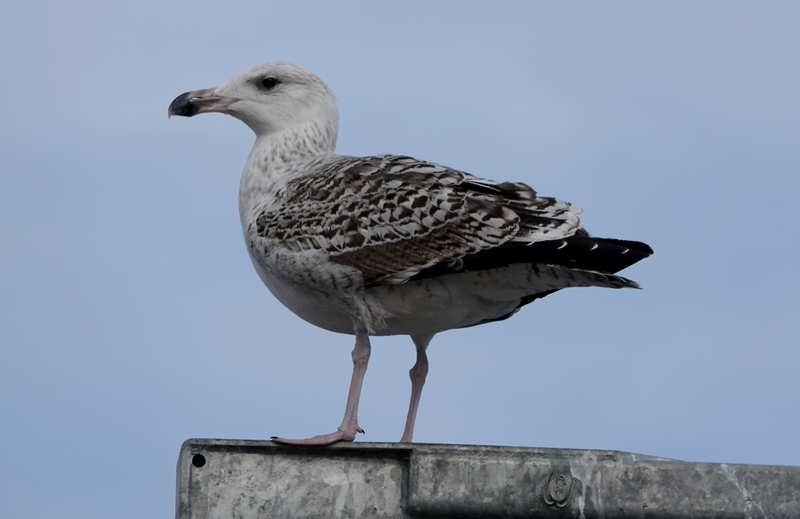 It should be noted that there is a perceived problem of Herring Gulls harassing the public, and feeding gulls normally would attract the ire of the good folk of Scarborough, but happily the south of the town below Holbeck tends to have fewer large gulls. I counted three adults, four third calendar year birds and a second winter individual. 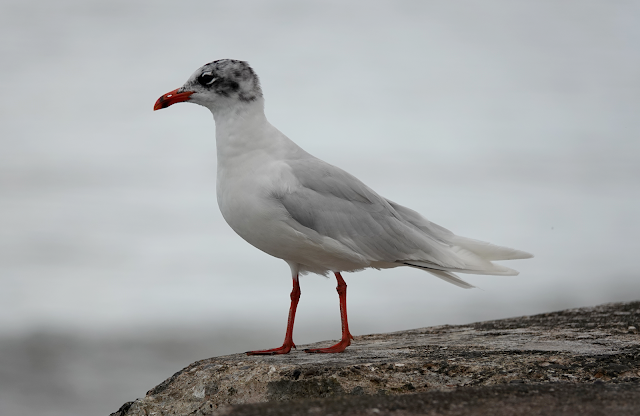 Mediterranean Gull - a second calendar year bird. 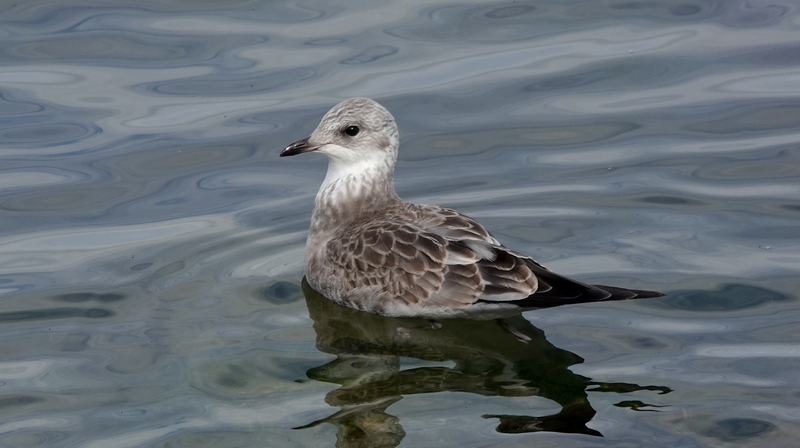 Aside from the Med Gulls, I had a few photographic opportunities including a lovely juvenile Common Gull. Such gentle looking birds. A two hour spell with the Peregrines on the headland produced one fairly satisfactory record shot. 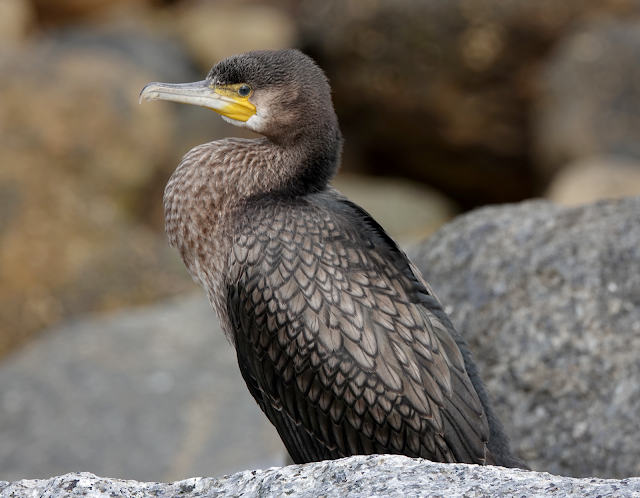 I was also pleased to get a juvenile Cormorant and Turnstone in perfect light. 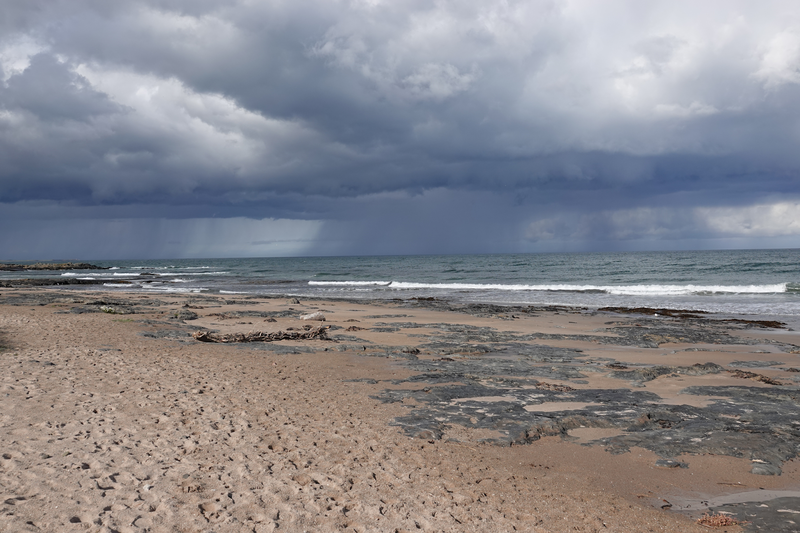 After a successful weekend in 2017, I was back for another summer trip, this time with a two night stay to enable a little exploration of the coast around Seahouses. I love this part of the country and was optimistic given a perfect weather forecast and some good photographic opportunities. I take an early train north and am in Berwick-on-Tweed before noon. This was the last but one day of the East Coast line being run by Virgin. After ticket splitting, I had got a first class return ticket from Grantham to Berwick for £131. For the same price I could travel around the Netherlands for a week by train and still have money over for beer. However, the train was spacious and my complimentary sausage sandwich was super, but not worth the fare. I have a short wait in the Scottish border town and then catch a bus, alighting at the seaside village of Seahouses. My accommodation was Quarry Cottage, a luxury bungalow on a small private estate, a stone's throw from Annstead Dunes and the beach, to the south of the village. The owner, Margaret Tucker just lets out the one room, an en suite double, which she also lets as a single. 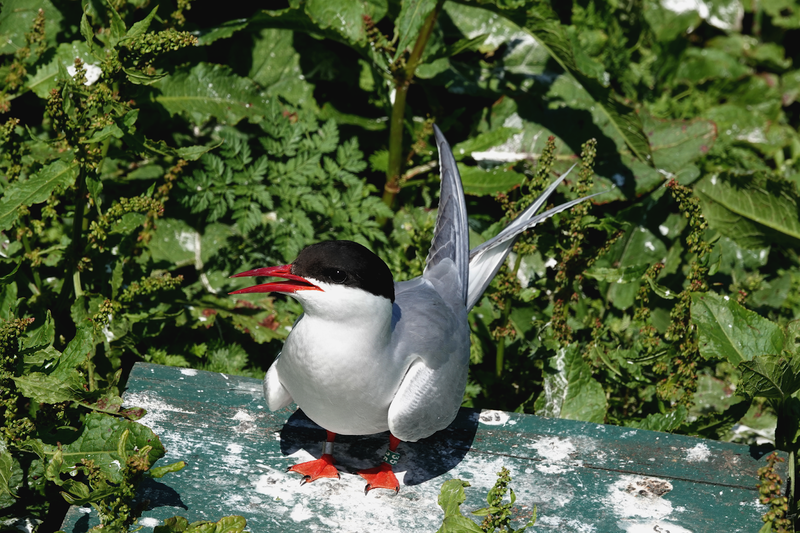 I just have time to drop off my rucksack and then head for the quay for the first of two booked trips to Inner Farne. The boat does a round trip of the islands before mooring at Inner Farne, where you get just one hour on the island. It's just about possible to see everything in that time, but an extra hour would be better. I can't imagine there are any places where it's easier to see breeding birds at such close quarters, especially Arctic Terns, which hold their ground and dive bomb mercilessly - seriously, bring a hat! 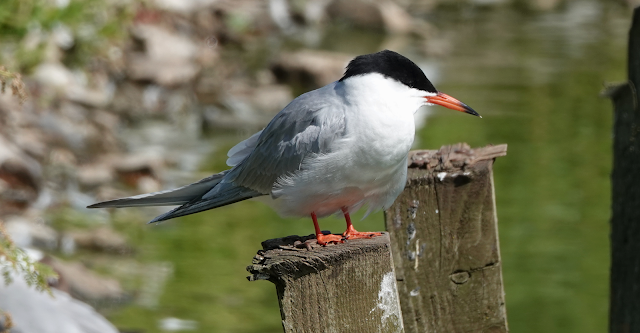 In far smaller numbers are Common Terns, and I see two birds during my visit, one resting on the small pool. 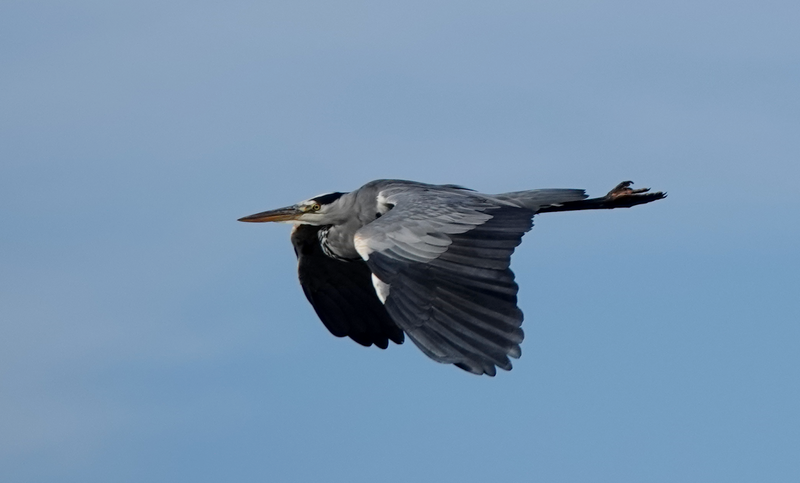 With no cloud, it was a little too bright for my liking, but I think the images are okay. Puffins, as ever are viewable down to a few feet and there can't be a better place in the country, if not the world to see this iconic species. 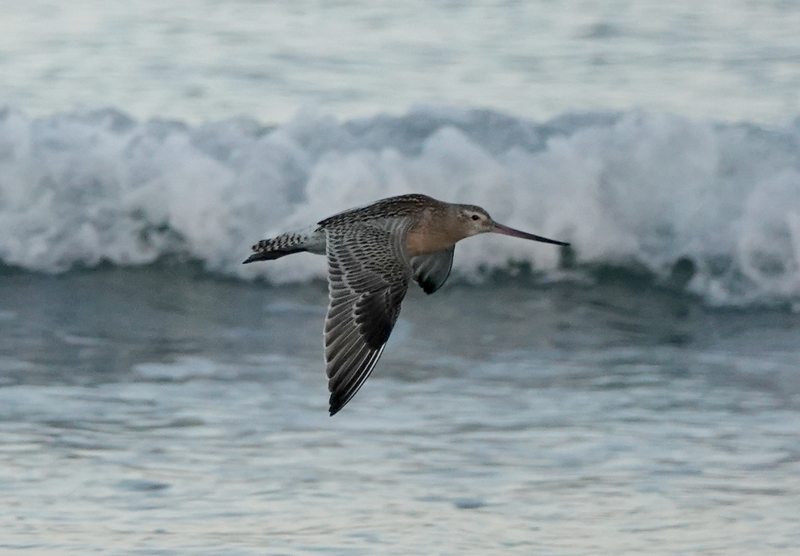 The light is now almost perfect, and I'm pleased with the detail on this photo, especially on the black upper parts. 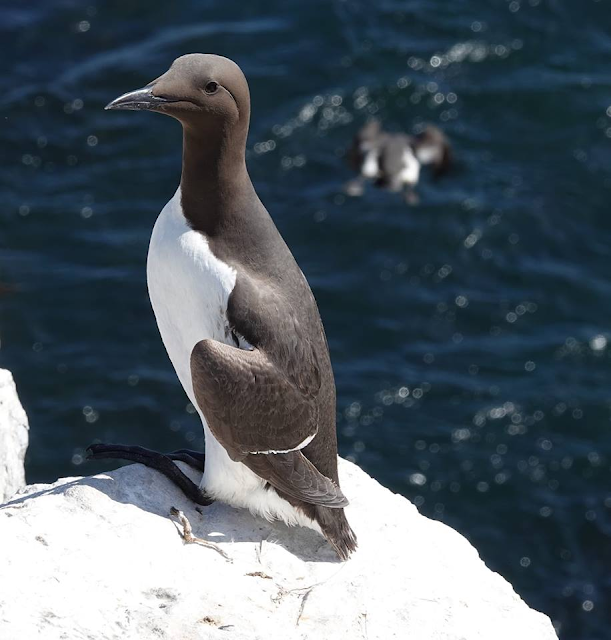 Also on the cliffs are Common Guillemot, Razorbill, Kittiwake and Shag. 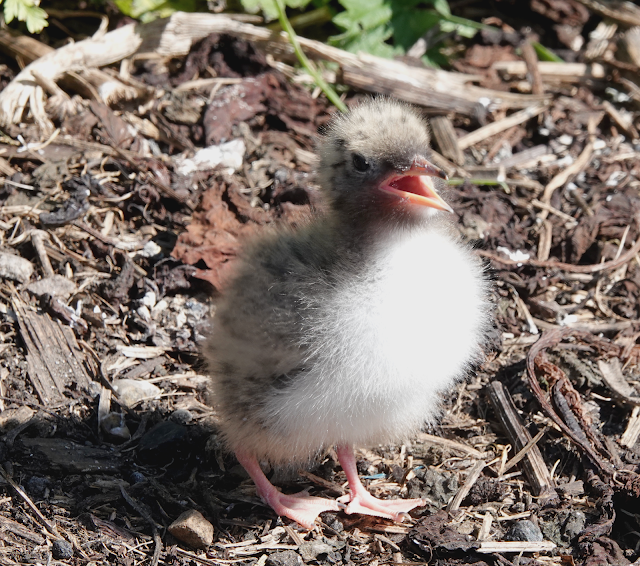 On the walk back to the boat, I run the gauntlet again but pause to get a photo of a cute little Arctic Tern chick. The adults nest right next to the path and one has to be careful not to step on the little scamps. A baby Arctic Tern just out of the washing machine. 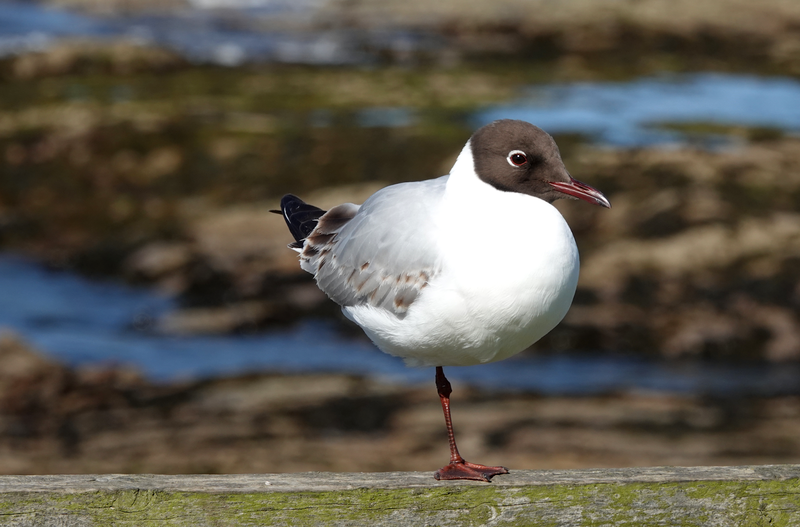 Back on dry land, I have a walk around the harbour where Black-headed Gulls are loafing, and I get a nice photo of a 1st summer bird resting his spare leg. After an ice cream I have a walk along the headland towards Lowgos Bay, but it is generally quiet, although I do get a nice shot of a pair of Fulmar on the cliffs. After a rather tiring day, I go for a fish and chip supper. I locate Lewis's Fish Restaurant, which I remember from last year. The lightly battered haddock, home-made style chips and mushy peas are delicious. The surroundings are nice, too. Probably my second favourite chippy after Mother Hubbard's in Scarborough. Now replete, I have a steady stroll back to the bungalow and just catch the second half of Germany v Sweden. It's 1 - 0 Sweden, then Germany equalize just after the interval. We then have to wait to the extra time of injury time and Kroos snatches a 95th minute winner. There then ensues what can only be described as a fracas. It's hand bags at eight paces between the opposing managers. 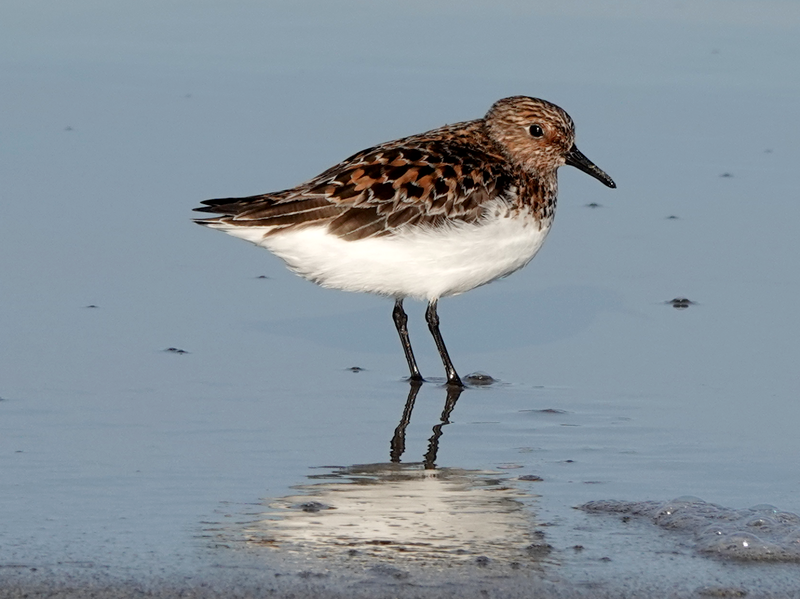 The next morning, I am out at 6 o'clock aiming to be on the beach to catch any waders before the dog walkers scare everything off. 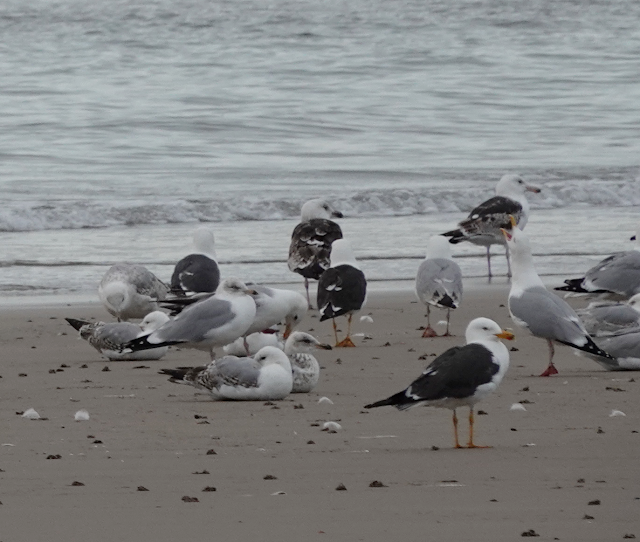 This proved to be a good idea, as I find a single Bar-tailed Godwit, five Ringed Plovers and a nice selection of large gulls loafing on the shore. I return to Quarry Cottage for a huge breakfast. Margaret cooks on her stove, while you tuck into orange juice and cereal, and one can watch the birds in her garden. 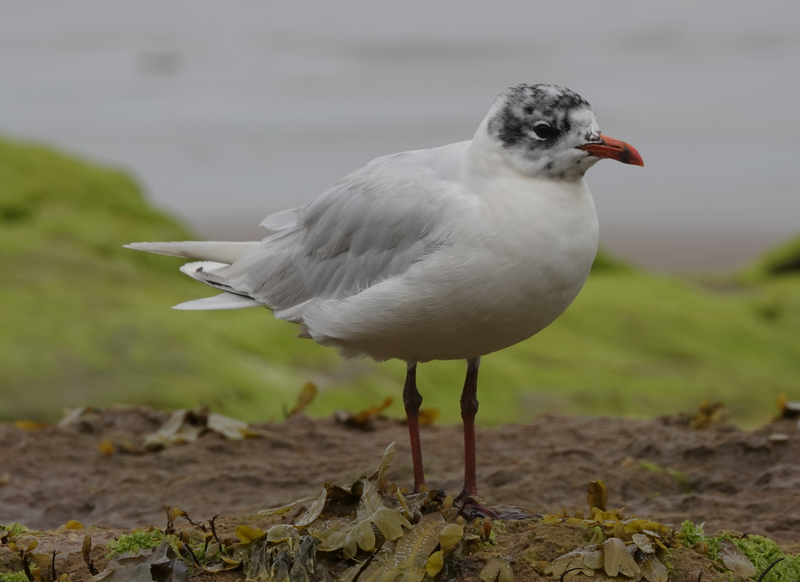 I set out again, heading over the golf course with the intention of exploring the dunes, then cutting back along the beach before another trip to Inner Farne. 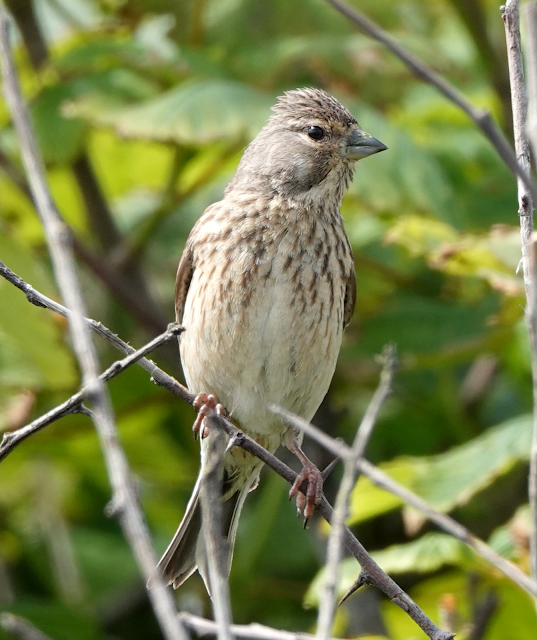 Along the edge of the golf course are a family of Linnets and a there is a birdie on the 1st, in the shape of a rather confiding Meadow Pipit. 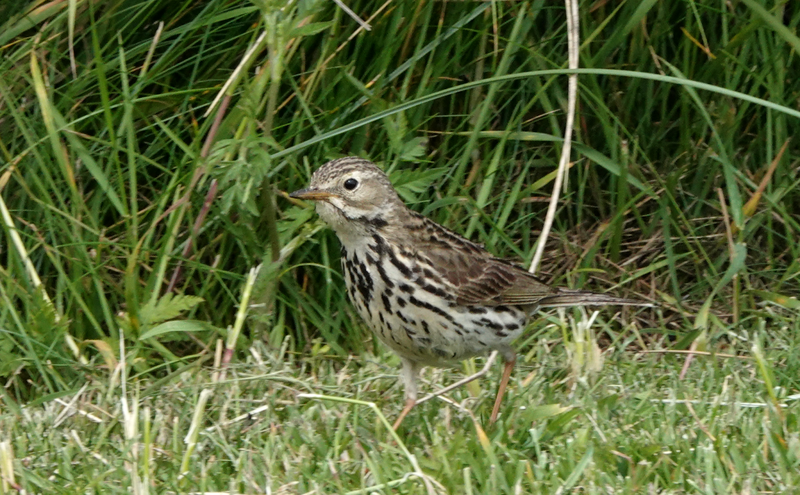 There are a lot of birds about with Song Thrush, Dunnock, Sedge Warbler and Pied Wagtail along the footpath. Cutting along the beach, which is now devoid of birds, I climb up to Annstead Dunes, which are full of Linnets, Reed Buntings, Common Whitethroats and Stonechats. 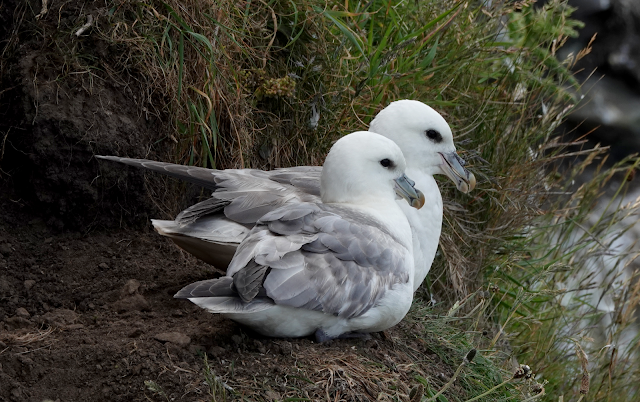 A pair of the latter appear to have young in the nest. 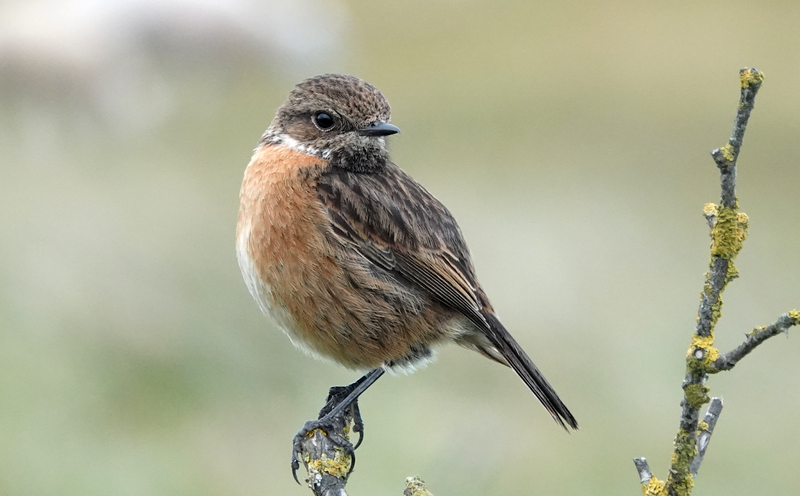 I see a female with a day-flying moth in her bill, so I don't linger for too long - except that the male decides to follow me! He seems to be remarkably inquisitive and ridiculously confiding and I have gone some way before he eventually flies back to his mate. 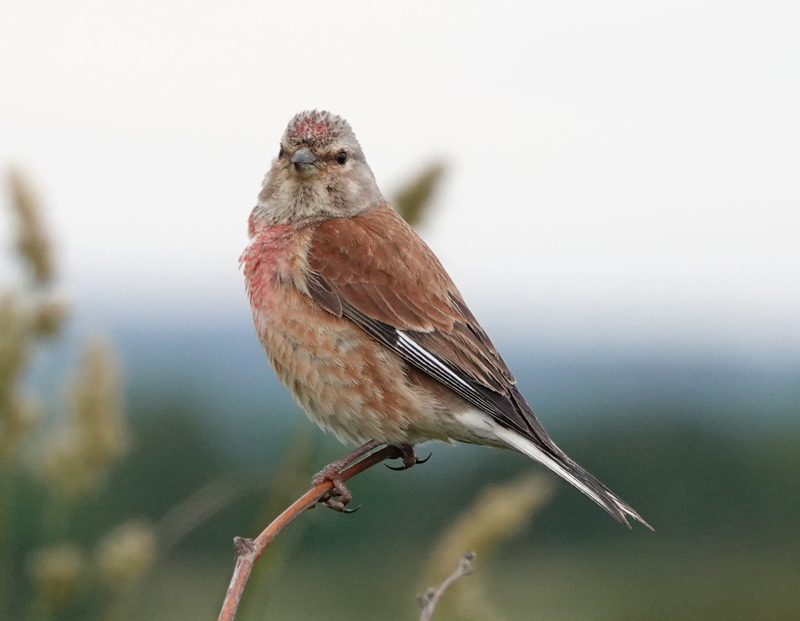 A little further along I hit another section of the dunes and encounter another family of Linnets, this time a female posing for photos. It's quite warm by the time I head back towards Seahouses and I have a much needed slug of water and spend five minutes at Lowgos Bay. 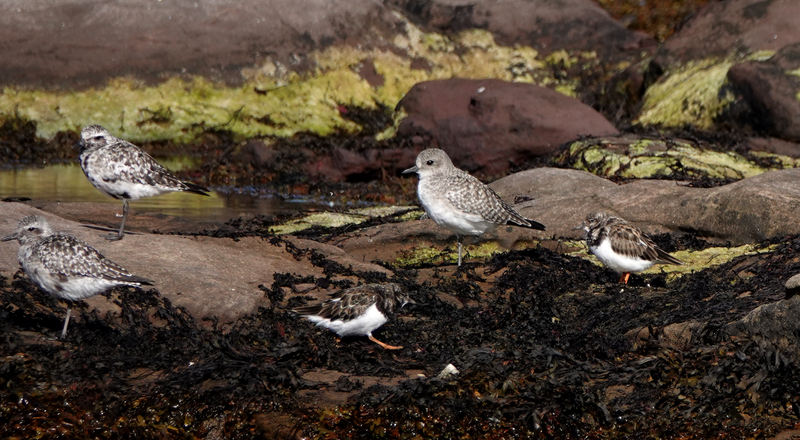 Five minutes becomes over an hour, as with high tide I can see a number of small waders roosting on the rocks. I make my way steadily towards them, pausing occasionally so as not to disturb the flock. Eventually I get within a few metres of the birds and get on my belly to take some photos. 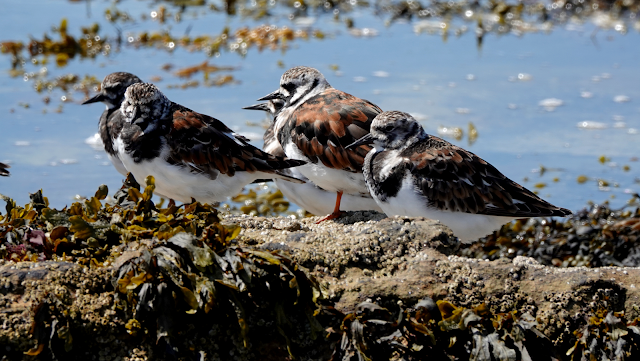 There's a nice selection, including 22 Ringed Plovers, 15 Dunlin, nine Sanderling and a few Turnstones. Continuing on my walk, the way goes past some sandstone cliffs where a few Sand Martins are swooping down and enter four holes, all which hold well-grown juvs. 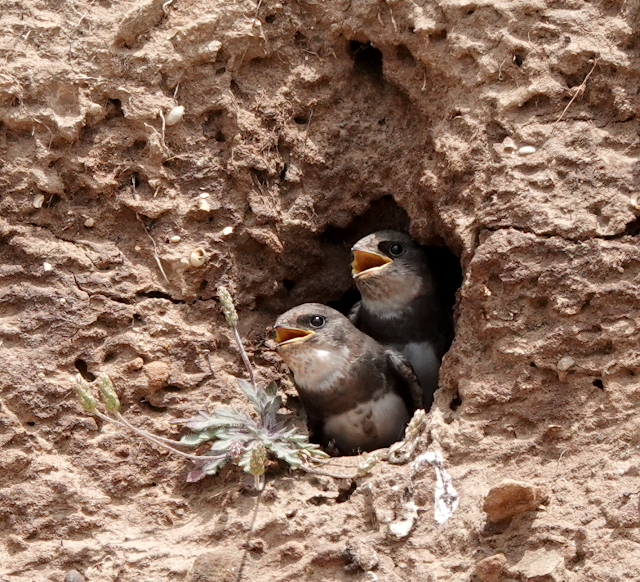 I pause to take a photo of the birds peeking out of a hole, and seconds later they fledge. Amazing! Having a little time before the boat trip, I take a seat outside a cafe and a have a piece of home-made cake and a pot of tea, which sets me up for the afternoon. The delightful waitress comments on my bins and camera and I show her some of my photos from the day so far. She tells me her father is a sea fisherman and sees plenty of auks and other birds around the coast. I board the boat and head for the back. 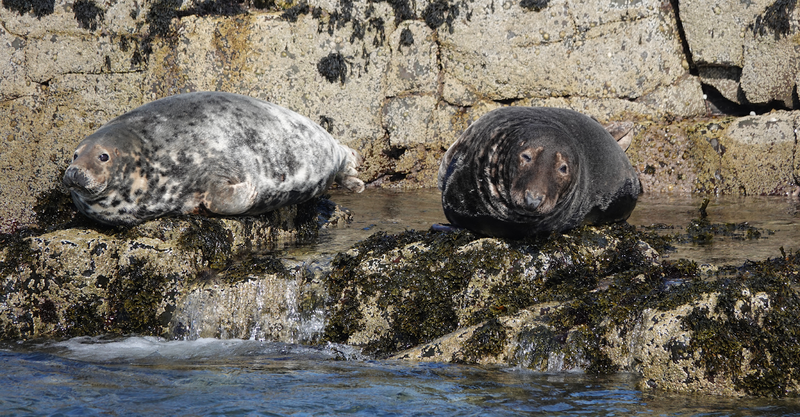 We do the usual cruise, and we pause by some Atlantic Grey Seals basking on the rocks. We get really close and they seem unconcerned. 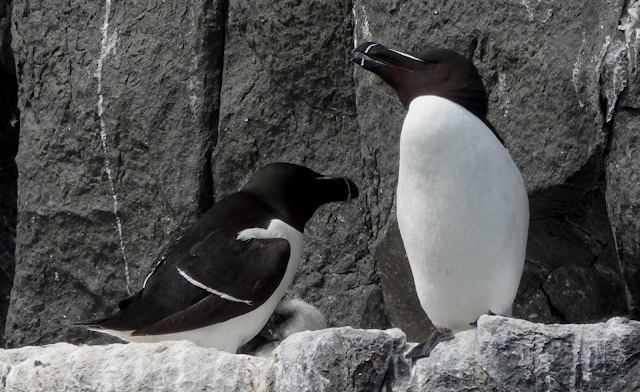 A bit further on, we sail around Staple island where there are thousands of auks, including Razorbills. 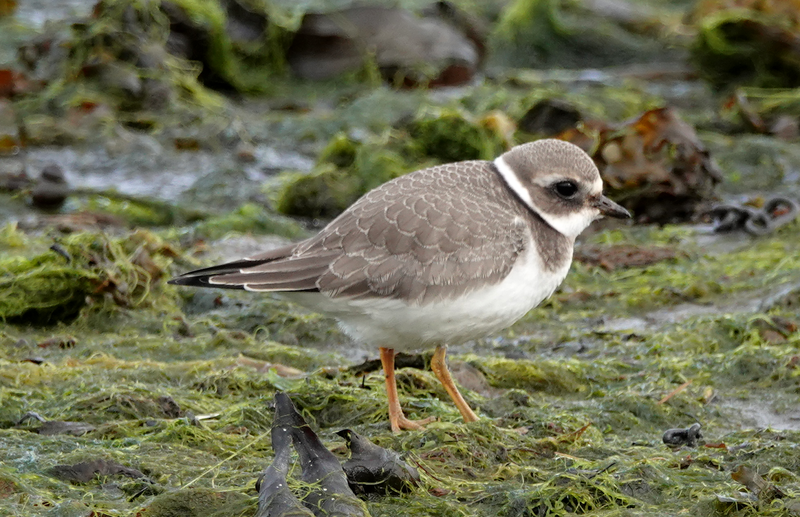 Failing to get any acceptable photos the previous day, I snap a pair with a small chick. 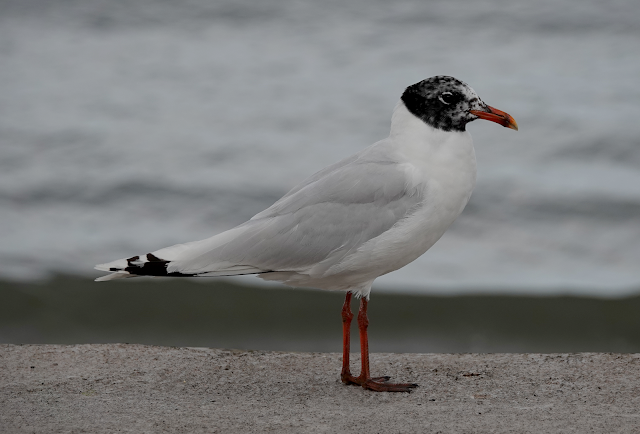 The birds have these space-black eyes, and somehow evoke the distant look of their maniraptoran ancestors. 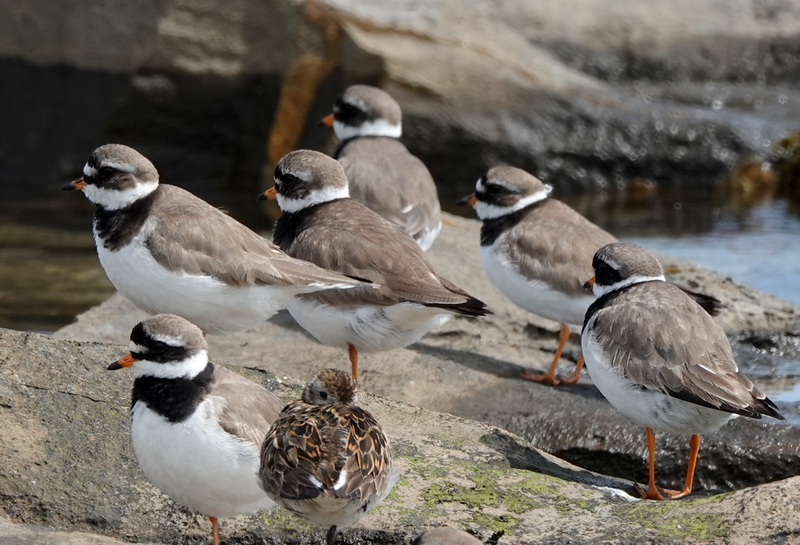 Back on Inner Farne, I go to photograph the things I missed the previous day. I spend some time watching the Sandwich Tern colony in the middle of the island. The birds are a little further from the path than in 2017, but I still get an decent photo of two birds pair bonding. 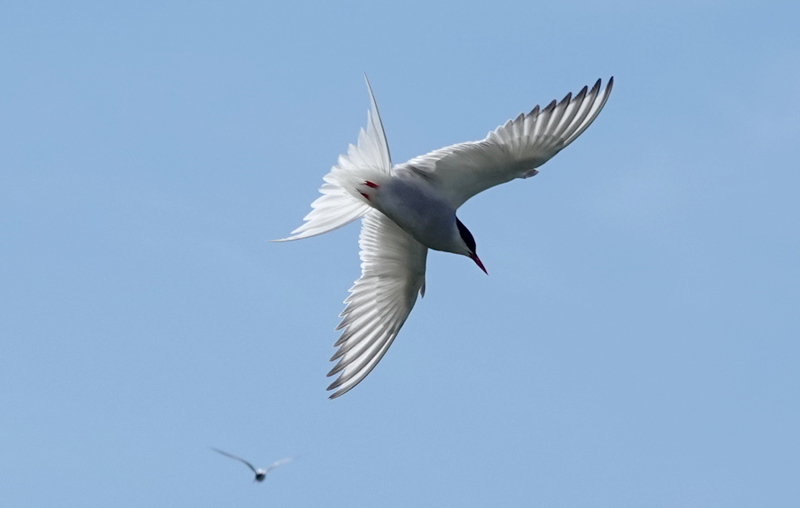 Back at the quay, I scour the terns for a Roseate to no avail. 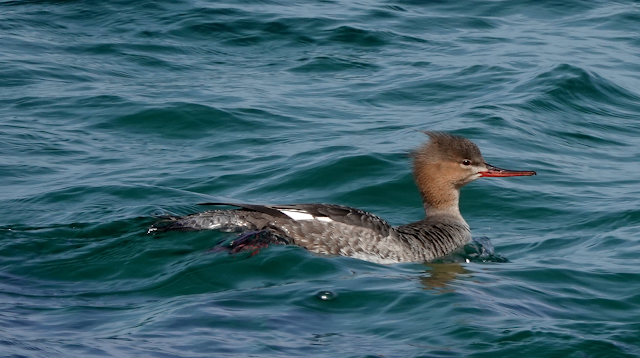 However, there are one or two 1st summer Arctic Terns and a female Red-breasted Merganser fishes just off the jetty. 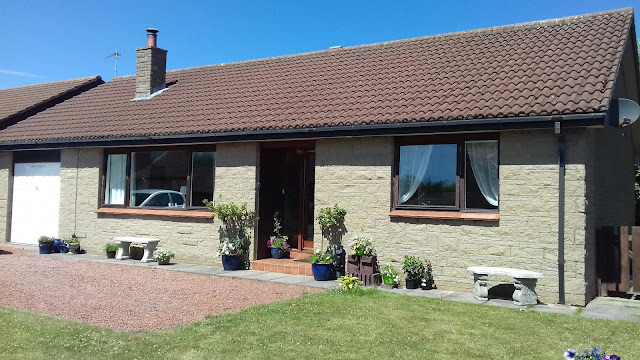 Back in Seahouses, I return to the bungalow as I had developed some kind of allergic reaction on my legs, no doubt from the dunes and need to find the relevant medicament in my first aid bag. Suitably anointed I head back to the village for tea. It's a glorious evening and I head along the coast via the golf course, where a single Raven is wheeling overhead. Descending towards Lowgos Bay, with the naked eye, I can see a small pale bird on the beach. 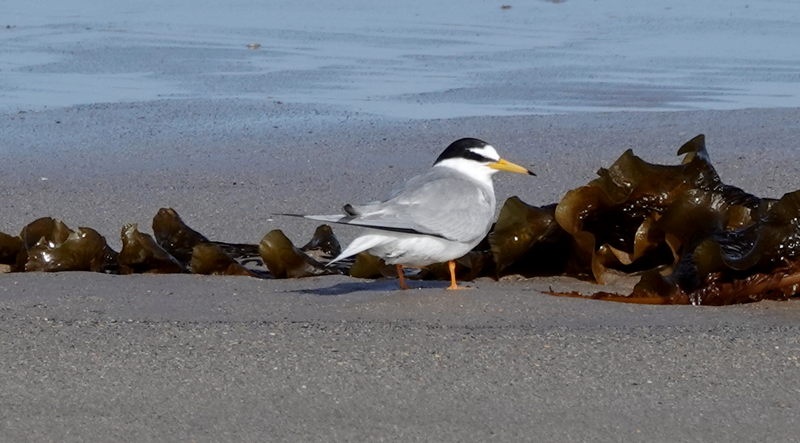 A quick look through the bins reveal a Little Tern. The bird flies around, doing a circuit over the beach for no apparent reason. However, the bird's behaviour is soon explained as a second bird, the male brings her a fish. 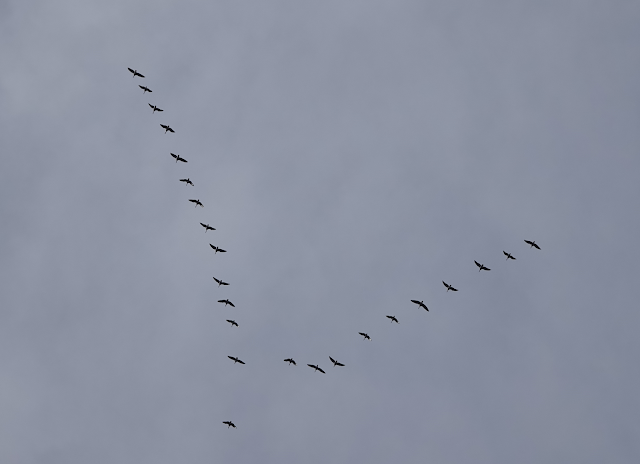 They then fly off together. 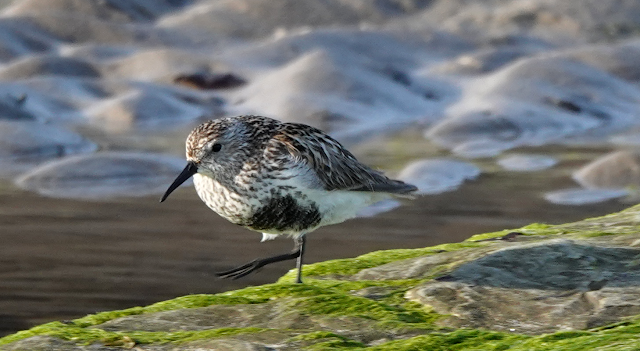 Further along the beach, there are a number of Sanderling, one or two in near full summer plumage, which isn't something you see every day, and they look beautiful in the strong evening light. 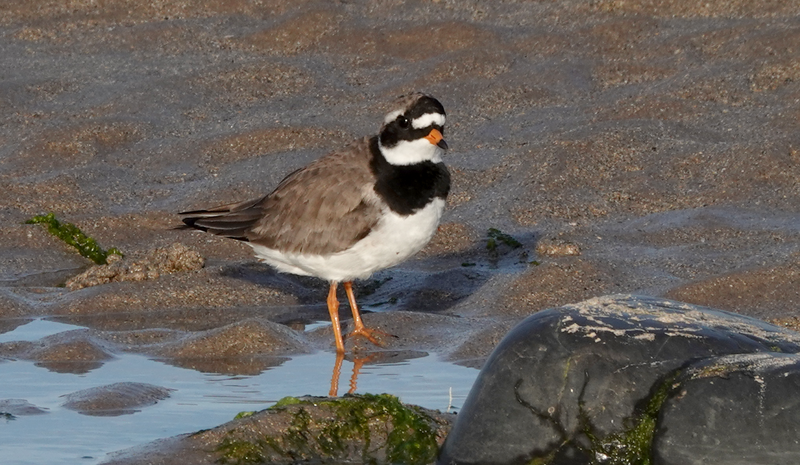 There is a rocky pool on one part of the beach where several Ringed Plovers and Dunlin are bathing, and seemingly unphased by my presence allowing some excellent shots. Sunday morning is cloudy despite the forecast of uninterrupted sunshine. 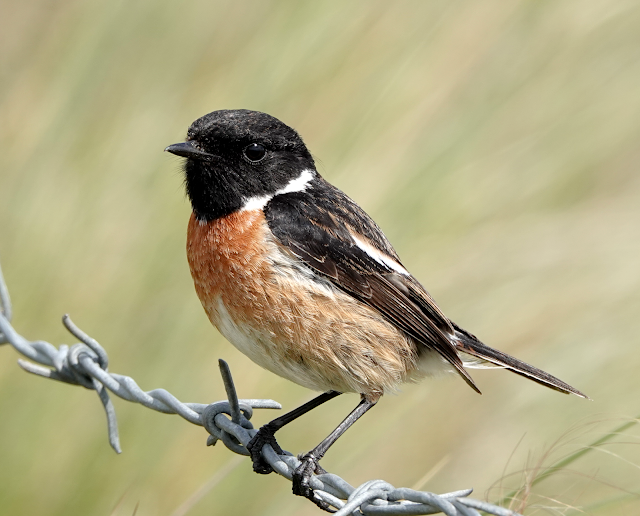 I'm up with the lark, and head through the dunes again. 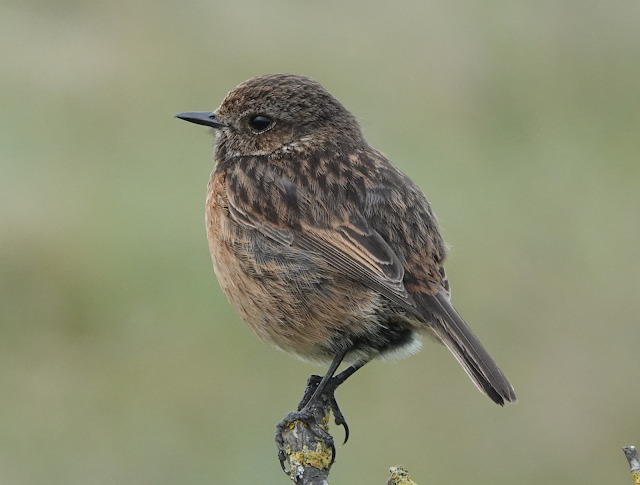 I'm almost at Beadnell, when a female Stonechat attracts my attention. 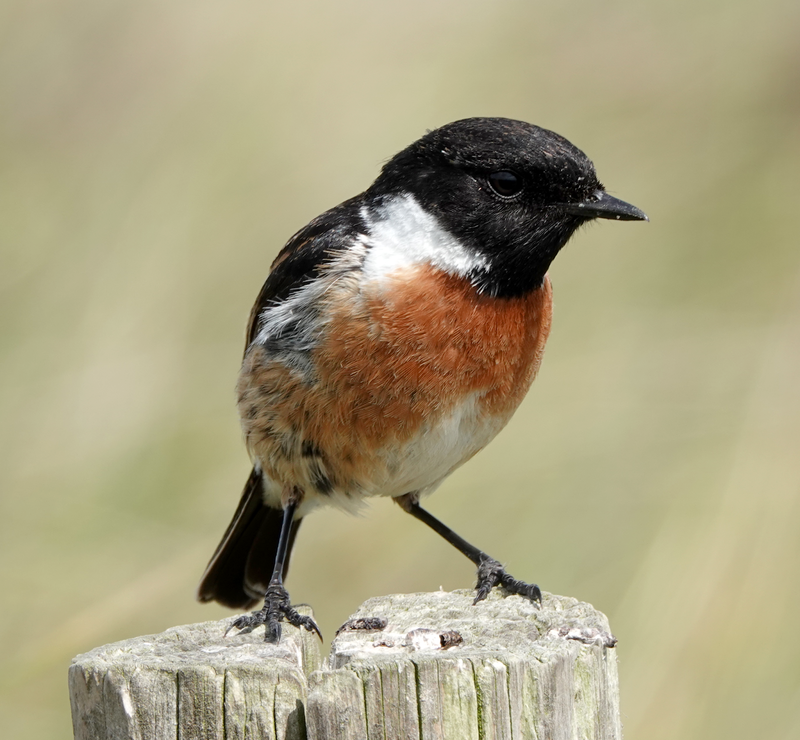 This bird is so confiding it makes the male from the previous day appear positively skittish! 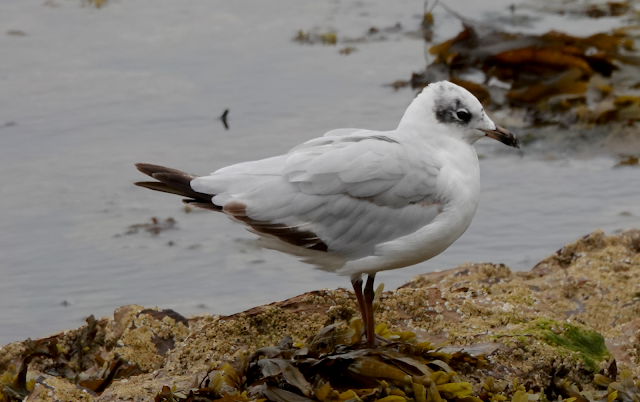 It's still only 7 o'clock and quite cloudy, but I'm really pleased with the photos. I head back for my breakfast, and then have a bit of a ramble and eventually get a half decent shot of some Turnstones, although the sun is now intense - so the weather man was right after all. I pick up my bags and get the bus back to Berwick and then my train connections south listening to England thrash Panama. Billy Shiels Farne Islands Boat trips. 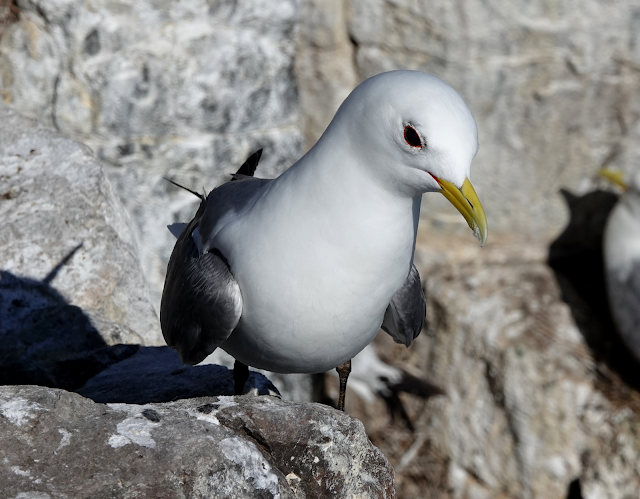 A two and a half hour trip including an hour on Inner Farne cost £19 plus a £9 landing fee payable to the National Trust (free to members). Obsessed with birds since the age of 11. County Recorder for Nottinghamshire since 2004.